Still hard to believe we will be seeing a different head coach on the sidelines next season. The Jim Larranaga era is over and the Paul Hewitt era is about to begin. I'm going to start by saying I like the hire, and I think this is the best case scenario that Tom O'Connor could have brought to Fairfax all things considered. NCAA basketball props found at BetUS would have you think guys like Jeff Jones being brought in made me really wonder where they were going with this hire but at the end of the day we have a head coach with both mid-major and BCS experience. He is known as a great recruiter, so much so that some media refer to it as over-recruiting during his time at Georgia Tech. Losing players to the NBA often is not something any coach at George Mason has ever had to deal with and Hewitt dealt with it a lot during his last few seasons in the ACC. I won't sugar coat his falling out at Georgia Tech, he was given a $7.2 million buyout for a reason. Some coaches need a change of scenery and a new opportunity. I'm sure the George Mason administration is hoping his mid-major and ACC experience will be a perfect fit for them in the CAA. We'll have to wait and see. -Despite his recent struggles at Georgia Tech he's still a coach that had mid-major success of going to the NCAA tournament and also took a BCS team to the national championship game. That's a pretty impressive resume to bring into the CAA. -George Mason is expected to be a strong team again next season with high expectations, they needed a coach who could take on this pressure. Mason fans will be expected big things for this team next season regardless of the coaching change. Hewitt is a better candidate to handle this than a young assistant with no head coaching experience. -Hewitt is an excellent recruiter and has dealt with a wide variety of talent. Remember that this guy did coach Chris Bosh and a number of other NBA players. Having recruiting success for both mid-major and a conference like the ACC is a valuable asset and certainly would be hard to come by from any other candidate they could have brought in. -Hewitt runs a motion offense with an emphasis on guard play, similar to what we have been seeing for years under Jim Larranaga. The emphasis on the guards will play into the strengths of what George Mason has already and should make the transition easier for the players. -While he has some nice highlights on his resume the fact remains that he had one season where he had a winning record in ACC play during his time at Georgia Tech. That was the year they went to the national championship game. His overall 189-160 at Georgia Tech doesn't quite wow you and he has only made the NCAA tournament three times in his last seven season. -Local media in Atlanta said that "positive energy hasn't existed around Georgia Tech's basketball program for the past few years". Not exactly encouraging news to read for a guy that is replacing Jim Larranaga; who was a constant beam of positive energy in Fairfax. -The same Atlanta writer notes that Hewitt did not respond well to criticism and often comes off as a very paranoid person. Critics won't be as tough on him in Fairfax but this team doesn't make the NCAA tournament or be in the running for the CAA crown he'll get some flack. At this point can he handle more criticism if things start off slow? -John Feinstein wrote yesterday that "Hewitt is never going to become the kind of cult figure Larranaga became at GMU". Some of the Mason nation will need time to get used to this transition. A large portion of the fan base only knows Jim Larranaga as the programs head coach and ambassador. You have to hope that the difference in personalities between Hewitt and Larranaga won't hurt the fan base as a whole. Only time will tell. The biggest thing he'll have to deal with is the constant refrain of "You're not Larranaga". Hope he's got a thick enough skin to handle this. Disagree Larranaga left for ACC and didn't retire here. He did great things for our basketball program, but the court name should go to a lifer. There is no requirement to retire at the school in order to be honored. Bobby Cremins didn't retire at Georgia Tech. Bottom line is Larranaga is the greatest coach in school history and did more for this athletic program than any person. If that's not good enough to put his name on the court I don't know what is. You could make the argument to put a statue of him outside the Patriot Center. Shoot, Michael Jordan got one in Chicago, and he didn't retire as a Bull. Give the man a chance. I remember people questioning Larranaga's hire when he arrived, and that worked out fine. Change is sometimes a great thing, so we'll see what happens. One thing Hewitt has dealt with before is replacing a legend: he replaced Bobby Cremins at Tech. So hopefully that experience has prepared him to replace Larranaga. Hate the hire, think he is a terrible coach, think we will be doing this again in 3 years. This is a ridiculous suggestion. He is now our coach, the last thing you want to do is come in and make some subservient action like that to pay homage to the guy you replaced. What he should do is be respectful when Coach L is brought up, but talk about the future, and lead the program. This guy has cred and no need for us to live in the past. Maybe we honor Coach L down the road like the 10th or 20th anniversary of the Final Four. Time to move on, we will always love Coach L …but now it is Coach H’s time! Except now he is trying to get our recruit Edwards to go with him to Miami... Agree with Hampton maybe a ways down the line, but not anytime soon. No, I'm not even remotely kidding. It's called public relations. He is taking over for what most in the GMU community consideres a legend. He would be remissed not to acknowledge and embrace that. I hope I am wrong, but the few times I watched Georgia Tech play it was a bunch of athletic dimwits running up and down the court trying to outscore the opposition. None of the defensive pressure or attention to ball control that characterized GMU recently. I worry that Hewitt is the sort of coach who wants to out-recruit the opposition rather than out-coach them. I doubt that that approach will work at GMU. You hit the nail on the head. I am a GT fan and watched his teams for 11 years. You will get very good players there, but if he doesn't hire some assistants that can help on offense you will see a team that is successful only by "out-athleting" them. We are hoping for a more fundamental style of play with our new coach. I find that much more entertaining. Good luck. As I said, with good assistants Hewitt can do some damage. The next few weeks will determine your fate. How about just hiring some good assistants, getting involved with the community himself, and focusing on the FUTURE of this team and not looking back. You can do both, you know? It's not like you're only allowed to do one or the other. It was done in Atlanta with Cremins Court. It'd be classy to do it here, as well. Don't forget that Hewitt has a better winning percentage than Larranaga had when we hired Larranaga. In our league, he only has to be better than Shaka Smart and Blaine Taylor, not Coach K, Roy Williams or Gary Williams. BIG DIFFERENCE. For those of you worried about next year, this is the perfect coach to lead a turn-key team. He's going to have high expectations and more patience than would a young coach, and he's already convinced two talented recruits to stay at GMU. Now, is he a long-term answer? No. Because no matter what he does, he's out the door in 5 years or less...and that's OK. That's the norm for good mid-major programs. Coach L was the exception to the rule. If Hewitt is successful, he will leave to get a second crack at the big time. If he is mediocre or poor, they won't keep him around long because the university will want to salvage what's left of Larranaga's legacy and the fleeting cachet of the university. Therefore, say your serenity prayer and worry about things in our control. We have a good recruiter and a damn good team coming back. We have a coach with ACC head coaching experience. We have a good teacher who wasn't necessarily a good in-game coach in the ACC, but he did win more than two-thirds of his games as a mid-major coach so he must know how to win on some level. He left Georgia Tech with his tail between his legs. What we need to do is welcome him with open arms and show him that Mason Nation is behind him. Let's help him rekindle that spark and passion. 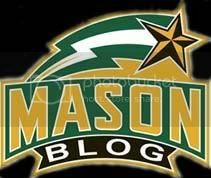 Let's also remember that six years ago, George Mason was just another mid-major program flirting with success. And today, while we're symbolilcally one of the faces of the movement to erase the term "mid-major," we are not (a) a BCS school, (b) the kind of place that will attract NBA talent or Hall-of-Fame coaches; nor (c) the best mid-major coaching job in the country (maybe top 5...MAYBE). Do we strive to overcome these shortcomings? Absolutely. But get your head right about what we ARE and what we're NOT, and when you look at it objectively, you'll see that Paul Hewitt is a GREAT hire. Why? Because six years ago, a coach of his stature NEVER would have considered this position. And that's a FACT. I was the Broadside sports editor 14 years ago when we hired Coach L. The student body was holding out hope that Tommy Amaker or Jim Harrick would swoop in and save us from the dreadful era of Paul Westhead. When TOC announced Larranaga as our new coach, we all scratched our heads in disbelief. I met Larranaga and was instantly charmed by his personality, and soon I realized what TOC was after. TOC understands how important men's basketball is to the university; as Merten said at the press conference, our basketball success gives us a platform to share the story of our university with the masses. TOC is on that men's hoops committee to network and to have a presence in that community. All of his gladhanding over the last 10 years at that post has put him in a position to know what other ADs and coaches know about the best coaches in the country. This hire was the result of all of those hours, and I think he got it right. Whatever you think about TOC, you will all have to admit that he pulled a rabbit out of his hat with Larranaga. You need to respect that, and it should give you enough reason to be confident that he made the right call this time around. If this is true than he should be able to talk all the players that were leaving into staying, and make a better team. He is already in the process of remaking the team. George Mason to interview Jeff Jones today? Who will be the next head coach at George Mason?